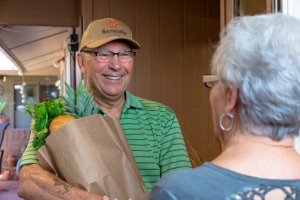 West Valley, AZ – Benevilla, the West Valley’s premier human services nonprofit, today announced summertime volunteer opportunities for grocery shopping volunteers for their Benevilla Home Services program. There is a lot to be learned from Elizabeth Andrew, an amazing humanitarian who said “Volunteers do not necessarily have the time; they just have the heart.” If you can improve the quality of just one person’s life, you have changed the world. If everyone volunteered a little the world would change a lot. Benevilla Home Services volunteers provide indispensable assistance to neighbors in need within our community. There are always many volunteer opportunities available at Benevilla but the program is in great need of summertime volunteers who can assist community members with their grocery shopping. The Benevilla Home Services program provides in-home care services supporting clients with the extra assistance they need to maintain their independence. Additional Home Services volunteer opportunities include helping with transportation to medical appointments, becoming a friendly visitor, light handyman services and more. Join Benevilla and make a difference in your community today. Benevilla is asking anyone interested in volunteering to contact Paul Barron, Volunteer Coordinator, at (623) 584-4999 or pbarron@benevilla.org. For more information about the many volunteer opportunities, please call or visit their website at www.benevilla.org. Started by the community and for the community in 1981, Benevilla is a not-for-profit family services agency dedicated to enhancing the lives of West Valley residents by providing care services for older adults, intellectually disabled adults, children, and families. For more information on services, volunteer opportunities, to take a tour or make a donation to Benevilla, call 623-584-4999 or visit www.benevilla.org. Benevilla is in need of volunteer Grocery Shoppers to support those in need in our community.